Want to drive traffic to your blog and boost your social activity? Well, I've got a simple solution to help you achieve just that: An expert roundup. And the best part is, you only need to write 20% of the content -- the other 80% is written by experts in your niche. It is, well, as long as you have the right process. Luckily, I've successfully applied this approach multiple times -- and I've learned a thing or two about how to drive the most traffic, shares, and engagement in the process. Have I piqued your interest yet? Good. Let's walk through how to apply this strategy below. What Is an Expert Roundup? An expert roundup is a collection of quotes or interviews by influential people in your niche. Each participant should be someone with some authority in your field and that has something to contribute to your readers. The most effective roundups pose a very specific question that the experts can easily respond to. It should be a question that people care about the answer to. As you can see, a roundup can really be about any topic. 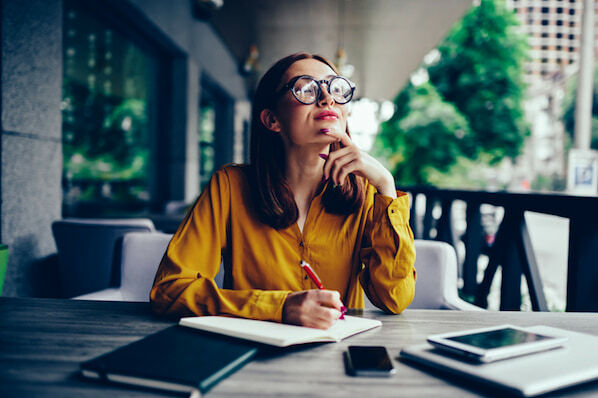 This is an excellent strategy to quickly establish yourself or your company within the blogging community for your niche. And since you will be linking, sharing, and promoting the responses of these influential people, many of them will be willing to help you down the line. Do Expert Roundups Actually Generate Results? Before I get into the results, let me give you a little background. I am the CTO and Founder of Proven.com. We provide a job distribution and hiring solution for small businesses. I love it, but it’s not always the sexiest topic to create content for. After all, it's tough to convince people to share a blog post about how to hire more efficiently with the same vigor that they share cat videos. As a result, many of our early blog posts were members of the "Triple Zero Club" -- zero shares, zero comments, and zero new subscribers. But this all changed when I started experimenting with expert roundups. My first roundup was the least successful and I definitely made some mistakes, which I will explain later. Despite the mistakes, I managed to get 16 experts in the HR space to respond to my outreach, and the article I created about the Best HR Software, generated 286 views in the first month, 71 social shares, and five backlinks. Relative to other blog posts we were producing at that time, this was actually pretty good. 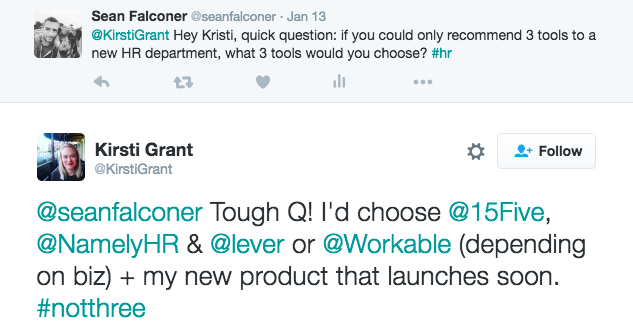 Most importantly, it helped me establish early relationships with blogging influencers in the HR space. That led to more successful blog posts in the future and guest blogging gigs with some of the best HR blogs available. Not to mention, Proven is now ranked #1 on Google for search terms like “hr blogs”, “best hr blogs”, etc. In my second attempt, I got significantly more ambitious. Over 150 different founders responded, which was actually quite overwhelming. That article, generated 1,747 views in the first month, 193 social shares, and 45 backlinks. In my third roundup, I contacted companies that have remote work teams and asked them about how to make remote work actually work, as well as the type of characteristics they look for when hiring a remote employee. The resulting blog post has been live for less than two months, but has already generated over a thousand views, 492 social shares, and seven backlinks. It also helped me build important relationships with several companies that I have since posted guest articles to their blogs. So, if you’re still with me, hopefully I’ve convinced you that this is a very effective strategy. But how can you pull this off for your domain? That’s what I am going to show you now, step by step. Step #1: Find the right question. 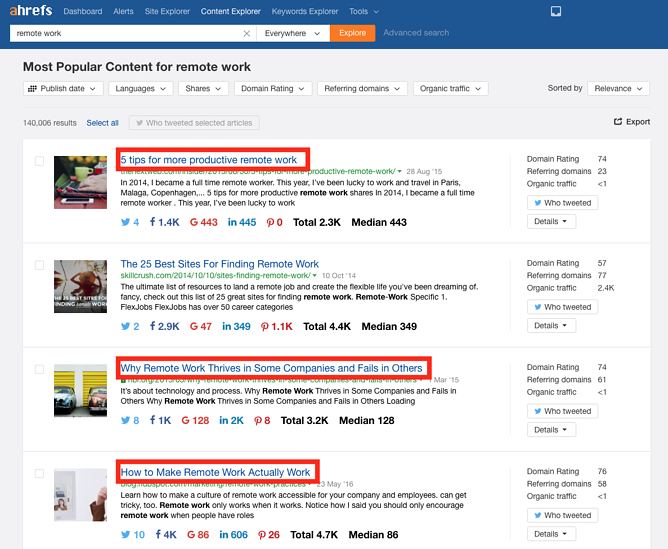 If you have a general topic in mind but you are not sure what would make a great question, then you can use tools like ahrefs’ Content Explorer or BuzzSumo to get ideas. As highlighted in red, three of the top four articles have great potential for crafting a roundup question. Pro Tip: Whatever topic you choose, you want to make it as easy as possible for your experts to answer the question. Make your question specific and limit the scope so that busy experts can provide shorter answers. Step #2: Find the right experts. Your experts are likely going to be comprised of bloggers, marketers, or perhaps company executives. If you’ve been working in your particular niche for a while, you should have a reasonably good idea about who the experts are. The bigger the names that you can attract, the more successful your roundup is likely to be. This is because their participation adds legitimacy to your article -- and as you’ll see in step #5, we will leverage our expert’s social reach to help promote the article. Step #3: Collect expert contact details. Start by creating a spreadsheet to keep track of names, emails, Twitter handles, and company or blog URLs. 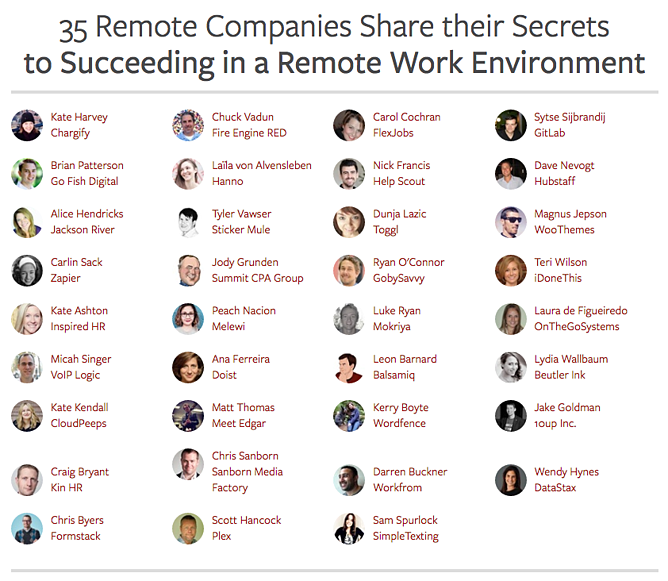 The example spreadsheet below is a snapshot of the expert contacts I used for my roundup about remote work. Note: You can tailor the details of your spreadsheet based on the type of information you feel is important to keep track of. Step #4: Contact the experts. I highly recommend reaching out to your list of experts at least twice. My general recipe is to first contact experts on Tuesday, and then send a follow up email on Thursday. To help you get started, check out my email templates below. The email formula is always establish rapport, be clear about your ask, demonstrate what they will receive in return, and thank them for their time. My name is Sean Falconer and I am CTO and Founder of Proven.com. We recently transitioned our entire company to working remote and as I understand it, [Company Name] is also remote. I am working on a blog post about companies that work remotely and I was hoping to be connected with someone at [Company Name] that would like to contribute. What is your number #1 tip for being successful as a remote employee? 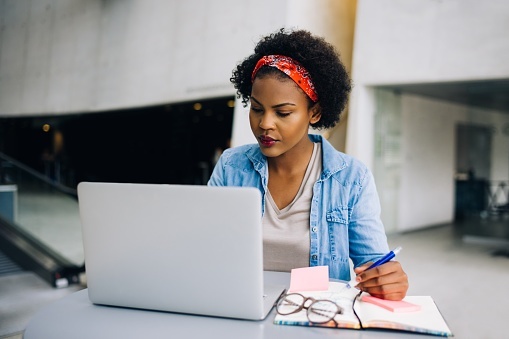 What is the number #1 characteristic of a remote worker that you look for when hiring? We'll feature your answer on our blog (http://blog.proven.com/) and link back to [Company URL]. A very brief response is more than enough! If you are not the right person for this, could you please forward this email to the appropriate person? If you have any questions about this, please do not hesitate to ask. I just wanted to follow-up on the email I sent a few days ago. Did you get a chance to take a look and consider contributing? If not, no problem. A number of your peers include [Company 1] and [Company 2] have already contributed but it would be even better if you were involved too! Thanks in advance, and naturally, I'll include a link back to you. In the second email, notice that I name drop a couple of peer companies -- this strategy is very effective. People may ignore your first email, but if they see a competitor or known expert has contributed to your article, then they'll often feel compelled to do so as well. Pro Tip: If you can’t find a particular expert's email address, you can try sending your question directly on Twitter. I did this successfully in my first roundup to collect answers from four people that I otherwise would not have been able to reach. Step #5: Putting it all together. If you followed these steps up to here, at this point you should have a great collection of awesome responses. Now, you need to put it together. Follow the suggestions below to get started. Your title needs three components: number of experts that participated, who the experts are and the topic the experts covered. In your introduction, you will want to present the problem, why it is important, and then how you solved it by reaching out to experts in the field. It’s important to emphasize how many experts participated and how amazing their responses are. Remember: You want to make the experts look good -- it will help with the next step. I also like to add a summary of the main takeaways so someone doesn’t have to read through every response to get a sense of the expert’s consensus. In my roundup about startup interview questions, I added the top five most asked questions to the introduction. After the introduction, you'll want to add a navigation that makes it easy to jump through the expert responses. If possible, put a face to the name by grabbing the expert’s image from Twitter or LinkedIn. You can ask for a headshot, but I always try to reduce the amount of work the expert needs to do in order to increase participation. This is the easy part. Your main body is going to be comprised of the expert responses. I like to include the expert’s image, Twitter link, link to their blog or company, a share link for that specific section, and their response. Keep this part short and simple: Summarize how awesome the content is and give a CTA to share or ask for people to submit a comment with their own answer to the question you posed. Step #6: Let the experts know when the post is live. In this final step, you will go back to the spreadsheet that you created earlier and reach out to all the experts that contributed to your article to let them know that it has gone live. There are a lot of great ideas and I think people will find a ton of value in the responses. I'd greatly appreciate it if you could help me share it out. If you require any edits, please let me know. Pro Tip: You should also contact all the experts that ignored your original outreach and let them know that the article has gone live and they can still get their answers in if they like. You will be surprised by how many people jump on this. One successful amplification technique I started experimenting with is creating periodic tweets with @ mentions of the experts that contributed to my article. 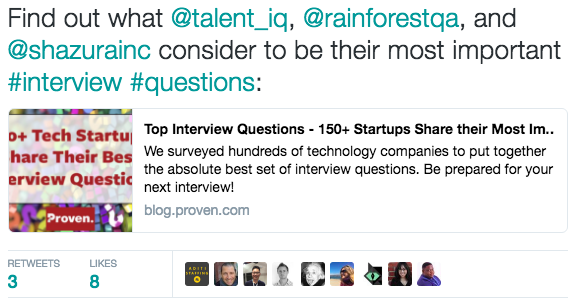 For example, although the "Top Interview Questions" roundup was published months ago, I recently created the tweet below and that gave some new life to the post on social media. The mentioned experts will usually retweet allowing you to piggyback on their social media presence. This approach serves as a fantastic way to build an extremely rich and engaging piece of content without a ton of research on your part. 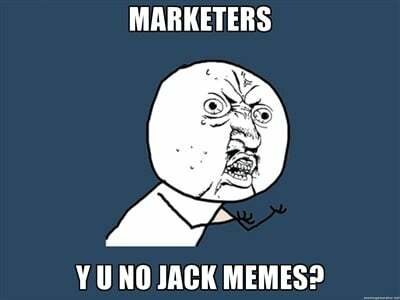 And the best part is, it works regardless of how boring your niche is. Get the experts on board talking about a key issue and you’ll have engagement like you’ve never seen before. Remember: Don’t settle for the "Triple Zero Club." What tips do you have for putting together an expert roundup? Share them in the comments.